As an almost-born-on-February-14 baby who missed the mark by making that grand entrance a few days early, my experience with Valentine’s Day was always something akin to Second Birthday. My mother, an unapologetic lover of kitsch, nostalgia and random memorabilia, would regale me with wistful stories about her excitement regarding something as romantic as having a baby on Valentine’s Day. She had to settle for an almost Valentine’s Day delivery, but she knew it was close enough to make February 14 gift giving a family tradition. For as long as I could remember, one of her prized possessions was an empty heart-shaped box of chocolates that my father had given her at the hospital, shortly after I was born. Although the contents had long since been consumed, the packaging they came in had memorialized their significance over a decade later. When done right, the packaging of a gift can become as significant to the receiver as the gift itself. For a brand, the packaging is a vital part of the marketing puzzle that can keep people ordering year after year, partly over the anticipation of getting their hands on a beloved wrapping paper or collectible package (think Liberty of London or the iconic blue box from Tiffany & Co.). According to industry research and data presented at PAC, the Packaging Consortium 2016 conference, modern consumers desire personalization and a sense of familiarity with their brands, which makes creative packaging an integral part of the user experience. Modern consumers in general, and millennials, in particular, want the ability to connect and interact with their favorite brands. To make a product stand out, consider Valentine’s Day packaging that will create a statement on its own. Embellishments like ribbons and bows make an otherwise plain package pop. Changing it up with something that can double as a collectible can truly make the gift stand out, enhancing brand recognition at the same time. Here is a modern spin on the traditional heart-shaped candy box, with a much longer shelf life. For packaging, sometimes less is more. Textures, patterns, and bold colored boxes can make a subtle yet effective statement. Like color, fabric can be used to create an association with certain seasons and holidays. Velvet adds a slight touch of luxury, and it is a great packaging choice for gifts like wine, chocolate, and jewelry. To modern, eco-conscious consumers, nothing says “I love you (and our beautiful planet)” like environmentally responsible packaging that can be repurposed and reused, without adding to the planet’s ecological burden. The customizable packaging of fabric totes and cotton bags is mindful and fashionable, and a great opportunity for personalization and branding. 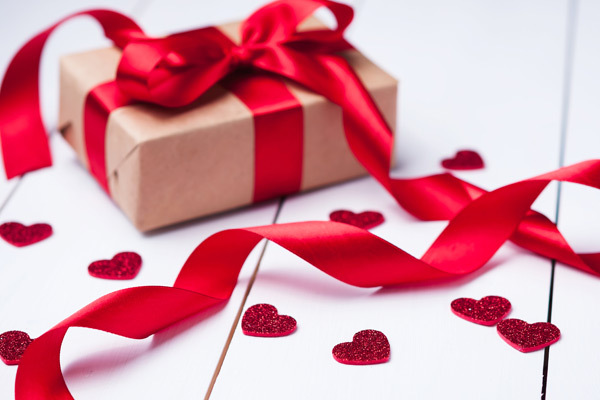 Valentine’s Day merchandise will probably always be synonymous with big red bows and heart-shaped candy boxes, just like the one my mother kept for all those years. However, a modern and unexpected spin on packaging can also build brand awareness by encouraging consumers to attach their own stories to their favorite products.